Why would I need self storage in Moorpark, CA? There are a variety of reasons why you might need self-storage in Moorpark, CA. How much is a storage unit in Moorpark, CA? The cheapest storage unit in Moorpark, CA is $61.00 per month. What size storage units do you have available in Moorpark, CA? In Moorpark, CA we have sizes that range from 5'x5' to 10'x30' to suit your storage needs. How much is it for a 5'x5' storage unit in Moorpark, CA? The cheapest 5'x5' storage unit in Moorpark, CA is $61.00 per month. Located in Ventura County, Moorpark is 50 miles east of Santa Barbara and 50 miles west of Los Angeles. The city first developed in the late 19th century. Largely agricultural in its early years, Moorpark grew with the addition of schools, churches and the Southern Pacific Railroad Depot. Today Moorpark is one of the most affordable places to live in California and one of the friendliest cities for businesses. It offers a variety of amenities, including local parks and libraries, while public transit makes it convenient to access all areas of the city. The origin of the city's name is a source of local debate, and though there are several different ideas, nobody is entirely sure where it came from. The most popular local legend says that the city was named after a small fruit: the apricot. Admiral Lord Anson was the owner of an English estate named Moor Park in the 1600s. Here, the apricot was introduced for the first time. This apricot was called the Moorpark Apricot, after its original home. In the area that's now known as Moorpark, California, large numbers of the Moorpark apricot trees could be found, leading many to believe they were the source of the city's name. Another popular theory is that because the green, rolling hills of the area resembled the Scottish moors, railroad surveyors nicknamed it Moorpark, and the name stuck. Moorpark and Ventura County have a reputation for welcoming businesses of all kinds. The city's largest employer, Moorpark College, provides thousands of jobs in the city. Along with the city's educational facilities, health care providers Community Memorial Hospital, Los Robles Hospital & Medical Center and Simi Valley Hospital are also major employers in the area. In Moorpark and the Greater Santa Barbara metro area, the largest industries include government, trade and transportation, leisure and hospitality, education and health services. If you're planning to look for a job in the area, you'll probably have success in the quickly-growing industries of professional and business services, trade and transportation, andleisure and hospitality. The Moorpark Unified School District serves students from preschool through high school. Many of the district's schools have received national recognition for academic performance. Utilities: Ventura County Waterworks manages local water services. The city's energy providers are Southern California Edison and Southern California Gas. Garbage and Recycling: Moorpark is served by Waste Management and Moorpark Rubbish Disposal. Your location will determine your specific provider, but you can expect both companies to provide curbside collection of trash, recyclables and yard waste. 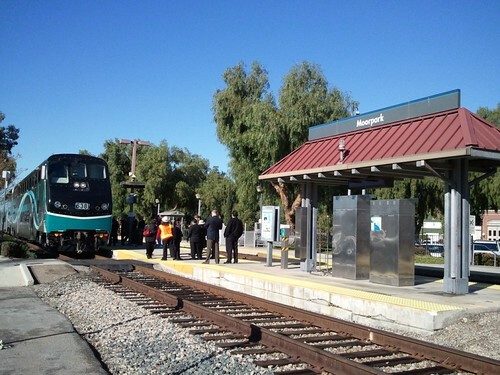 Transportation: Moorpark Transit provides an intercity network of bus routes, and Metrolink offers commuter services to Los Angeles. If you're looking for the most affordable housing in the city, search along the southern edge. More expensive homes are nearer to the center of the city, close to Moorpark Country Club and Rustic Canyon Golf Course. Moorpark offers a relatively affordable median home price when compared to nearby Los Angeles, but i'ts still well above the national average. Our lowest priced units in Moorpark, CA average $61.00 per month. 59 people have reserved units in Moorpark, CA in the past 30 days. There is 1 location within Moorpark, CA's city limits. There is 1 location in Moorpark, CA that offers AC and Heating features.